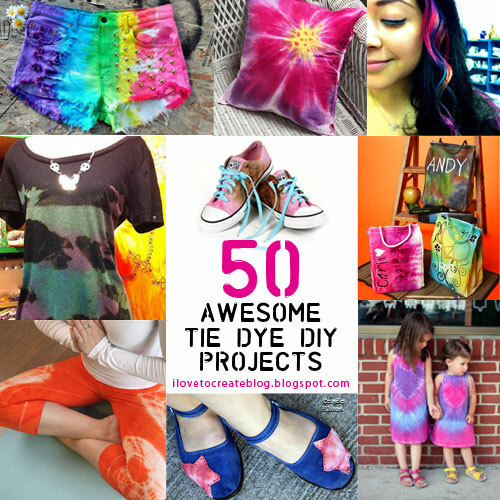 Here at iLoveToCreate, we do a LOT of tie dye projects! Everything from curtains to shoes to shirts and more. We also see a lot of great tie dye projects using our Tulip One-Step Dyes as well that we're quite smitten with! We've rounded up a great list of 50 smashing projects, from fashion, to kids, to home décor you'll want to try yourself. So take a look at these super easy ideas! Which of these ideas are you DYEING to try? WOW! Very cool! I live in tie dye. I just tried to do that Sharpie technique with mixed results. Have you ever tried to do a tie dye pvc chamois cloth? I am trying to work out how the cloth will take the dye but I guess it will be a lot of trial and error. Hi there, This is Julia from FaveCrafts just stopping by to say thanks for linking to our site! Tie dye is so popular right now and we're so glad your readers are loving the trend too! Have a great day! Wao all of dyes are awsomely awsome.